John D. Furber is a scientist and entrepreneur who has been studying the biology of aging, development, and regeneration for more than 25 years. 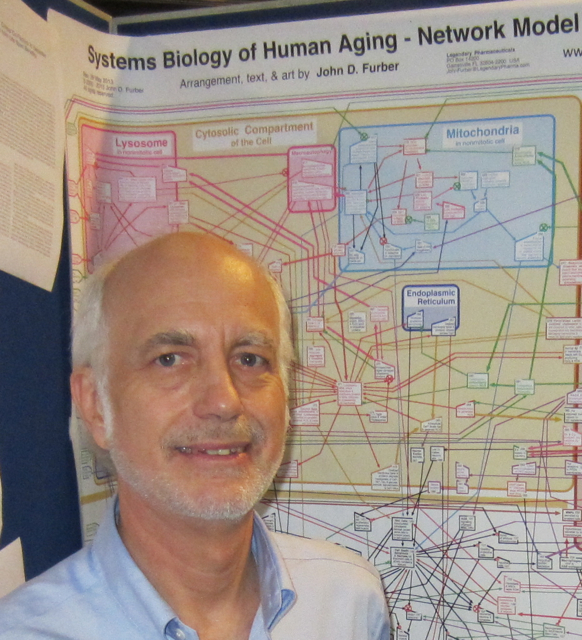 During this time, he has been piecing together a Network Model of the Systems Biology of Human Aging, which can be seen at https://legendarypharma.com/chartbg.html.He is a frequent contributor at meetings in the fields of aging, mitochondria, autophagy, and oxidative stress. These include: Gordon Research Conferences, Cold Spring Harbor Conferences, Ellison Colloquia, Harvard/Glenn Symposia, American Aging Association, Gerontological Society of America, International Society on Aging and Disease, SENS Conferences, Oxygen Club of California World Congresses, and the Bay Area Aging Meetings. From 2000-2011, he served on the Board of Directors of the American Aging Association and was twice elected as VP. He earned a Bachelor degree in Physics and Mathematics from the University of California at Santa Cruz in 1975, and a Master of Science degree in Biological Sciences (Developmental and Molecular Biology) from the University of California at Irvine in 1990, where he advanced to PhD Candidacy. Between degrees, he served the United States Congress as a Technology Policy Analyst in the Congressional Office of Technology Assessment. Mr. Furber was a principal in starting five companies during the 1980s and 90s. Currently, he is running Legendary Pharmaceuticals, small pharmaceutical research company that is engaged in the discovery of pharmaceutical drugs and gene therapies able to repair and reverse accumulating molecular damage to subcellular mitochondria, lysosomes, nuclei, and extracellular proteins in order to prevent and treat serious, late-onset diseases commonly associated with aging. Legendary Pharmaceuticals is a privately-held small business. Early career: Mr. Furber served four years on Capitol Hill at the Office of Technology Assessment of the United States Congress. In 1979, he joined Solar Electric International, which set up photovoltaic-powered irrigation systems for World Bank projects in developing countries. He also started Pleasant Valley Software Corporation (1984) with a consortium of investors from Europe, India, Canada, and the US. Teaching Biology laboratory courses at the University of Kentucky and the University of California, Irvine. Visiting Research Scientist at the Buck Institute for Research on Aging. Currently, at Legendary Pharmaceuticals, he is engaged in pharmacological research involving therapeutic target identification, screening and optimizing candidate therapies, organic synthesis, purification, and testing, as well as ensuring regulatory compliance. Teaching: During the 1990's, he taught Human Biology at Skyline College, near San Francisco, and taught Management Decision Making at Menlo College, near Stanford. During the 1980's he taught Biology laboratory courses at the University of Kentucky and the University of California. He also started and ran a successful private tutoring service during the 1990's, which helped many students to learn Physics, Mathematics, Statistics, Chemistry, Biology, and Computers. Currently, he frequently lectures on topics related to analyzing the Systems Biology of Aging to find effective therapeutic targets to prevent or treat diseases of aging. International: Mr. Furber has made multiple trips to Europe, China, India, the Middle East, Southeast Asia, Africa, and the Caribbean to consult, lecture, and study. These have given him an appreciation of other cultures, and advanced possibilities for foreign collaborations. Mitochondria Interest Group at the U.S. National Institutes of Health. He is a frequent contributor at meetings in the fields of aging, mitochondria, autophagy, and oxidative stress. He served on the Board of Directors of the American Aging Association from 2000 to 2011, and was Vice President in 2008-2009. John has created several web pages which provide useful links for researchers and the lay public interested in Aging, Nutrition, Bioinformatics, Genomics, and Molecular Cell Biology. For further details, please see https://www.LegendaryPharma.com/chartbg.html. halting maturation, and eventually causing death. and finally allow realization of the age-old dreams of rejuvenation. Chapter 19 in The Future of Aging: Pathways to Human Life Extension. Ed. by G.M. Fahy, et.al. (Springer Science+Business Media B.V. 2010) DOI 10.1007/978-90-481-3999-6_19. Furber JD. "Extracellular glycation crosslinks: prospects for removal." Rejuvenation Research. (2006 Summer); Vol. 9(2): pp.274-278. "Inducing Exocytosis to Remove Lipofuscin", SENS6 Conference, Cambridge, United Kingdom, September 2013. "Extracellular Aging and Regeneration" Manhattan Beach Project Longevity Summit, California, November 2009. Rev. 3 April 2019. © 2000 - 2019 by John D. Furber. All rights Reserved.